Everyone loves a great looking set of nails, perfectly trimmed with a glossy coat of paint or left plain so that the natural pinkness shines through. Unfortunately, you might sometimes wind up with toenails with white spots or patches, perhaps even rough and coarse to the touch. So, what causes white toenails and is there a way for you to get rid of them for good? There are many reasons you could wind up developing white streaks or spots on your toenails, and many of them stem from causes that are completely preventable. We’ve also rounded up some great at-home treatments for white toenails that will help you restore them to their natural color. Combine that with a little extra care and a few precautions with your toenail health, and you’ll soon be able to proudly put your feet on display in open footwear again! Trauma to the toenail without breakage of blood vessels can cause white spots to show up below your toenail. 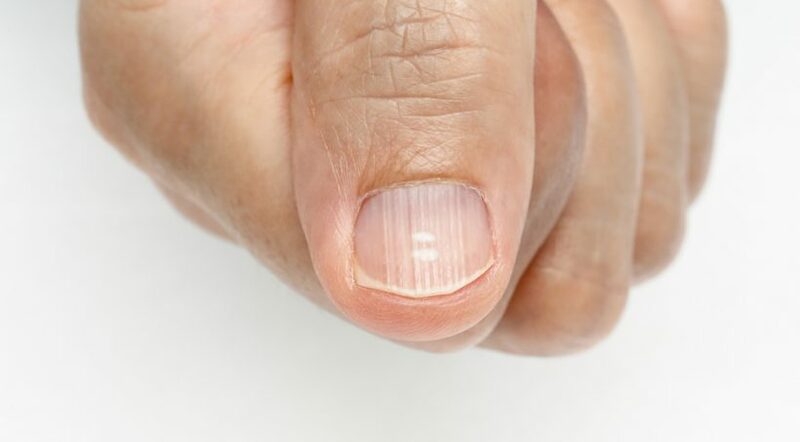 Over time, this will grow out as your toenail grows normally. If, however, there is bleeding below the toenail, it will turn black and not remain white. Fungal infections of the outermost toenail layer can result in a stark white discoloration in the toenail. Onychomycosis starts as small white spots that spread across the toenail over time. Proximal subungual onychomycosis is a rarer form of fungal infection that affects those with weakened immune systems and starts as a whitish patch at the base of a toenail, close to the cuticle. Recurring trauma to a toenail can cause white lines to crop up in the toenail itself. This might be the result of things like wearing shoes that are too small for you, so when you run or walk, your toe might constantly hit the shoe. Protein deposits in the nail bed as a result of a medical problem or trauma in other parts of the body can also result in white toenails. Heart disease, kidney problems, eczema, psoriasis, and pneumonia are some such conditions. Allergic reactions to nail products like nail polish or gloss, hardener, and even nail polish remover may cause white toenails. Mineral deficiency of zinc or calcium also causes white toenails. Do not mistake white toenails for the normally white area known as the lunula which lies close to the nail fold. This is present in everyone and is normal; only the size varies between individuals and might be larger than others in some people. This is not a condition that needs any treatment. Depending on what caused your white toenails, the symptoms may differ slightly. The Pencil Bright Biological Repair Pencil is a simple and effortless solution to your problem of white toenails. If you notice sediments and brittle white toenails, this is a safe treatment to try to stop the fungus in its tracks. Simply apply it on your nail and nail contour thrice a day. A set of three boxes make up a full course of treatment, with long-lasting results kicking in after three courses. Users of the product can’t get over how easy it is to use and how well it works. Developed after extensive research and combining ingredients from the East and the West, the Pencil Bright treatment for white toenails fights the fungus and restores nail health. The anti-fungal tincture helps keep the fungal infection in check even as your toenail grows back stronger than before. You will see noticeable changes in 2 to 4 weeks, with results becoming visibly more evident after 4 to 12 weeks. The worse the infection, the longer you may need to use it. What’s more, this remedy for white toenails also helps strengthen your toenails and gives them a lovely natural shine and smoothness. Its protective effect ensures you have nails that look and feel healthy. Will White Toenails Cause You Problems? If you have a fungal infection that is causing your white toenails, leaving it unchecked can make it go worse. White superficial onychomycosis will spread across the entire expanse of your toenail and make it crumbly and rough to the touch. Over time, you might even wind up having to remove the entire toenail surgically if the infection or whiteness spreads throughout and becomes painful. The infection could also spread beyond the toenail to other parts of the foot or body. Diabetics may also develop other complications and must contact a doctor at the earliest. 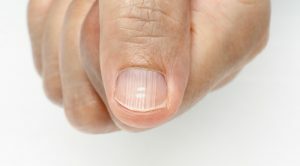 And while medical conditions like a weakened immune system from HIV or heart or kidney problems won’t get worse because of your white toenails being untreated, not attending to the problem might cause you to overlook these serious health problems which should get urgent medical attention. These home remedies target the fungal infections that cause white toenails. They use readily available ingredients that don’t require prescriptions and are all natural. Combining a couple of these remedies may heighten the results. For instance, you could do a daily baking soda foot soak and also use coconut oil or tea tree oil as topical remedies. Tea Tree Oil is a popular remedy for a variety of fungal infections, including foot or toenail fungus. Apply it a couple of time a day to the affected toenail and keep up this regimen for a few months to ensure your toenails are completely free of the fungus. Eucalyptus Oil applied to the area can help with toenail fungus. Coconut Oil can also be applied directly on the affected toenails to fight fungus and white toenails. Snakeroot extract or Ageratina pichinchensis is a popular anti-fungal remedy used to treat white toenails. Household pantry staple baking soda can also be used to treat toenail fungal infections. A paste made from baking soda and water or a spoon of the baking soda added to warm water as a foot soak can work well. If you feel that the symptoms are worsening or the problem persists even after treating it, you should get in touch with a doctor for further treatment. Also, do keep in mind that because some medical conditions which require immediate medical attention may also bring on these symptoms, it is a good idea to see a doctor if you are at risk of those illnesses. Avoid getting frequent pedicures – this may cause damage to your nail beds. Take care not to strike or pinch your toenail. Avoid using acrylic and gel nails. Consume a diet that gives you adequate levels of calcium and zinc to prevent mineral deficiency linked whitening of the toenails. Avoid using nail products that may have triggered the allergic reaction. Take care of your foot hygiene to avoid fungal infections. Always ensure your feet are nice and dry before you pull on socks and shoes. Wear shoes and socks that let your feet breathe. White Toenails are an annoyance that can become more than an aesthetic issue if left unchecked. It is best to deal with the problem as soon as possible and let your toenails get back the clean and healthy look that comes with being well cared for. Keep in mind the simple remedies you’ve just found out about, try the at-home treatments, be a little more mindful of the products you use on your toenails, eat a balanced and healthy diet, and you should soon see a huge improvement in how your once white toenails look. ← Can Vicks Vaporub Help Treat Toenail Fungus?